ab52460 recognises Cytokeratin peptides 4, 5, 6, 8, 10, 13, 18. 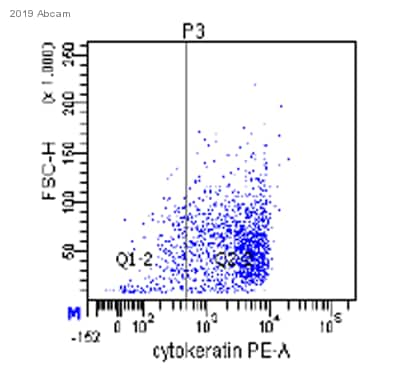 Keratin-enriched preparation from human epidermoid carcinoma cell line A431. Prior to conjugation, this antibody was purified by Protein A affinity chromatography. The purified antibody is conjugated with R-Phycoerythrin (PE) under optimum conditions. The conjugate is purified by size-exclusion chromatography. Our Abpromise guarantee covers the use of ab52460 in the following tested applications. Flow Cyt Use 1-2µl for 106 cells. (in a 100µl cell suspension). 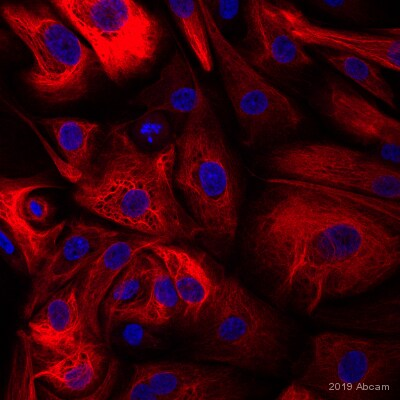 Intracellular flow cytometry analysis of cytokeratin expression in HT-29 human Caucasian colon adenocarcinoma cell line using ab52460. Overlay with Isotype mouse IgG1 control.